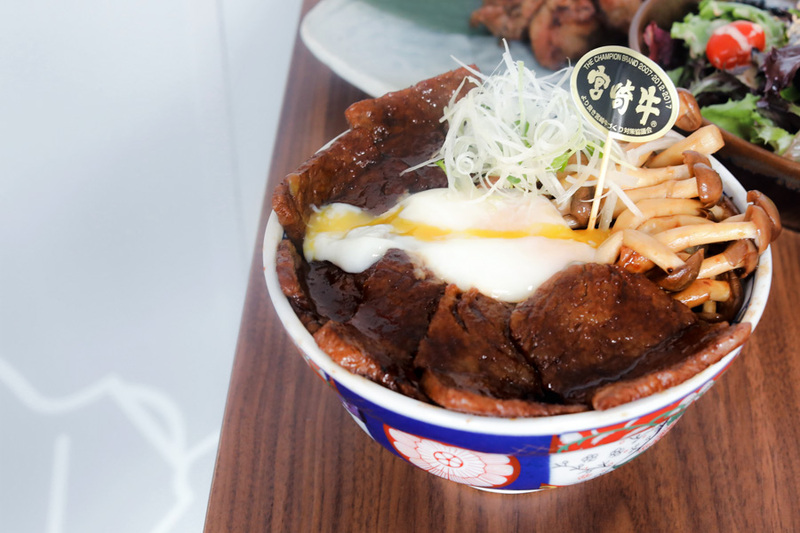 This is for fans of affordable and flavoursome Japanese donburi. 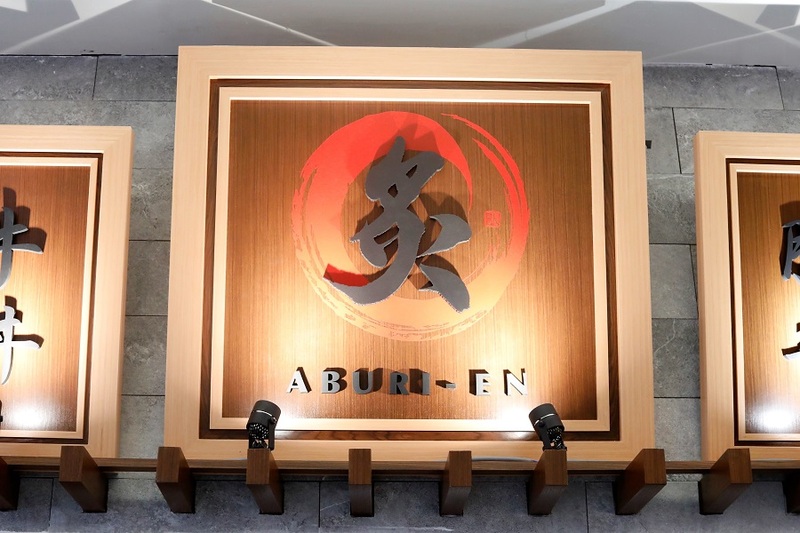 Aburi-EN is a cosy nondescript Japanese joint for hearty rice bowls, now located in two locations in Singapore – Tanjong Pagar Centre and VivoCity. 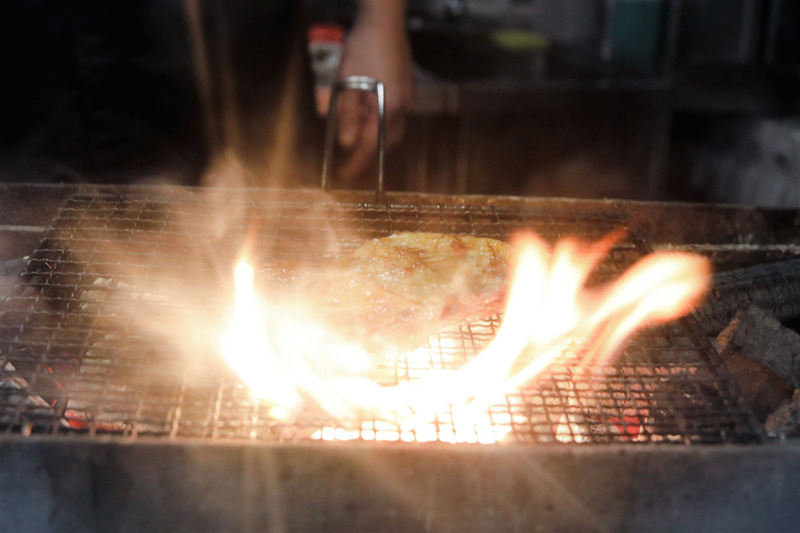 It specializes in aburi (literally means “flame seared” or “torched”) meats skillfully grilled over binchotan. It is also all about that MEAT. Aburi-EN uses premium beef no less than Japan’s No. 1 champion beef, the Miyazaki Wagyu. Miyazaki Wagyu won Japan’s “National Wagyu Award” for 3 consecutive times, a prestigious award held every 5 years. Here you’ll experience A4 and A5 grade Miyazaki Wagyu, with A5 being the highest class of Japanese beef and highest marbling grade. This intense marbling gives the beef its unique tenderness and umami flavor. The pork is just as exceptional, using a superior chestnut-fed pork, known to be tastier than normal pork. It is harvested from carefully selected pigs which enjoys a natural diet that contains chestnuts. 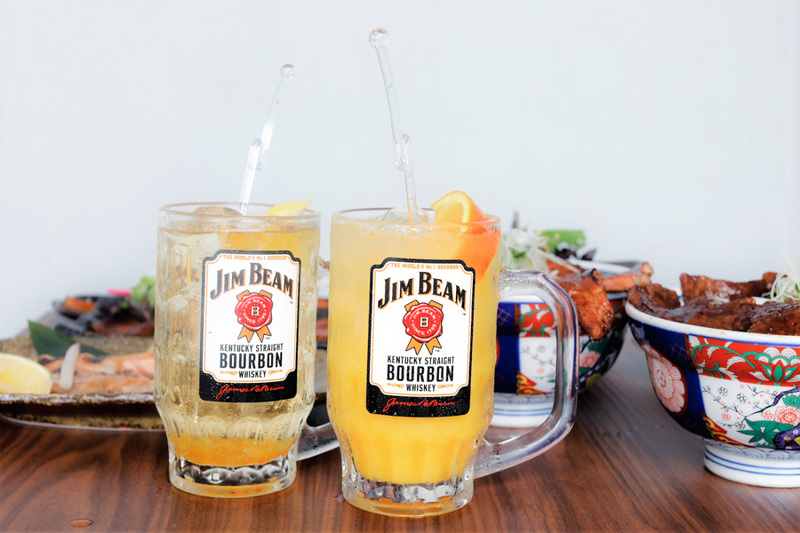 This contributes to a tender juicy meat with a sweet nuance. 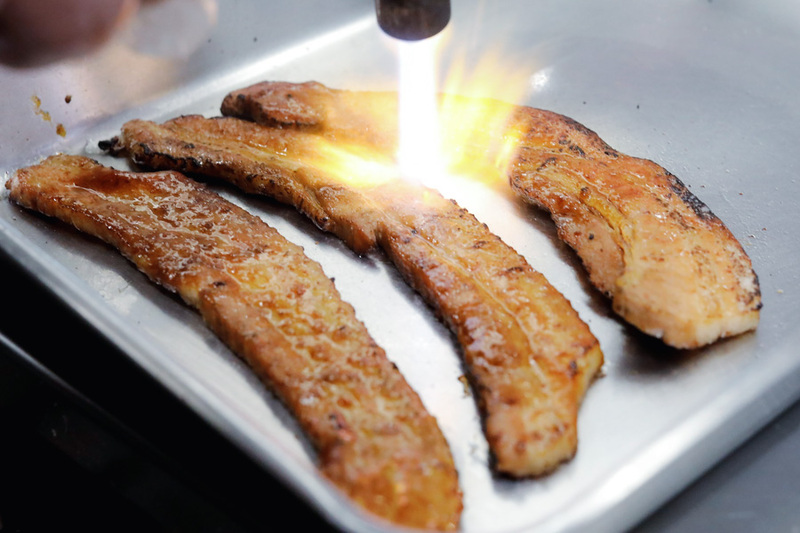 The use of binchotan in cooking these high-end meats is essential to the Aburi-EN experience. Otherwise known as Japanese white charcoal, binchotan is a type of quality and expensive highly dense charcoal made of high grade oak. Because of its high carbon content, it is rendered odorless which allows the natural flavours of food to shine through. Moreover, it burns slowly without flaring unlike lump charcoal and briquettes. This gives a deep smokiness to the meat minus the charred flavours. Hungry yet? 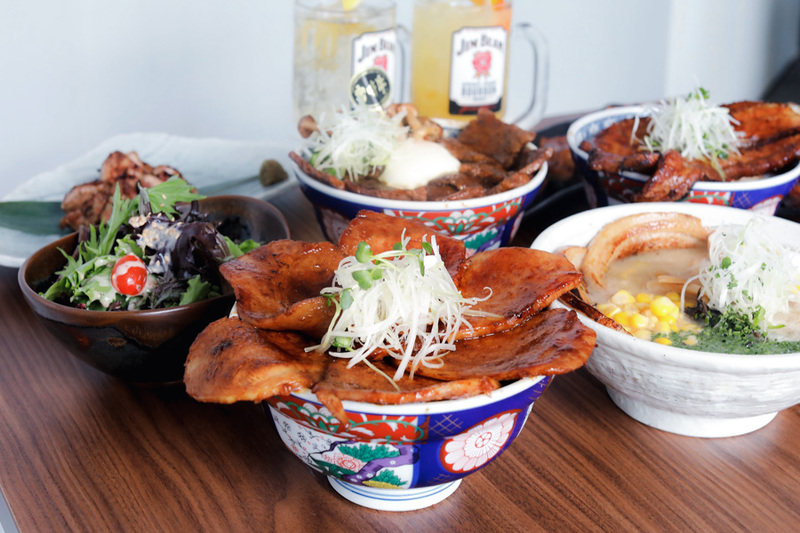 Here are the 10 recommended donburi and sides from Aburi-EN. 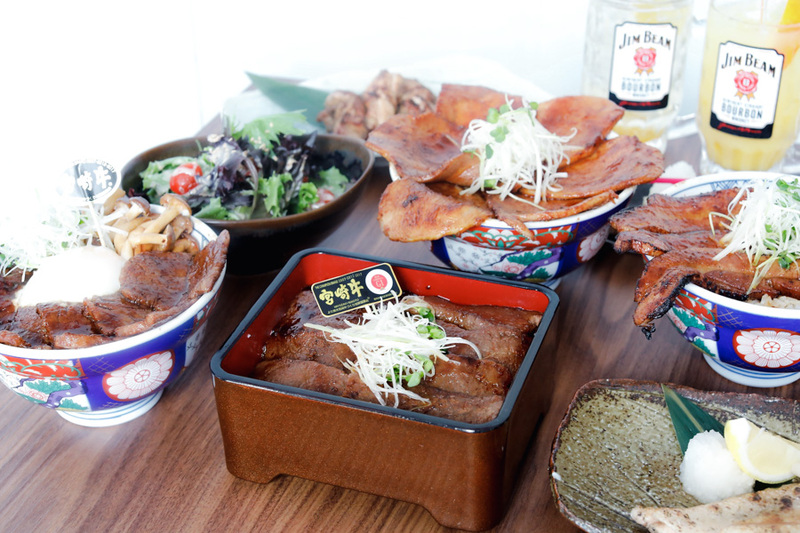 Get the Premium Wagyu Jyu (rice box set) which comes with Aburi-EN’s pride – premium Miyazaki Wagyu beef that’s well-marinated in a savoury soy based “Miyazaki sauce”. This original sauce is created by the kitchen team, created using many fruits and vegetables which give it that sweet touch. 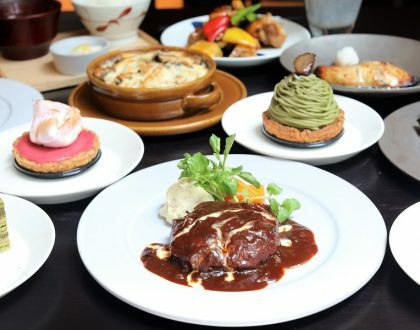 This deep flavoured meat along with its full-bodied gravy goes well topped over steamed Japanese rice. You can’t go wrong with this signature, definitely a treat to meat lovers. This top selling dish is made with Miyazaki Wagyu karubi, or boneless short rib/flanken-cut rib, one of the most popular cuts of beef for yakiniku. Karubi has more marbling than roast cuts do so expect this meat to be very tender and juicy. 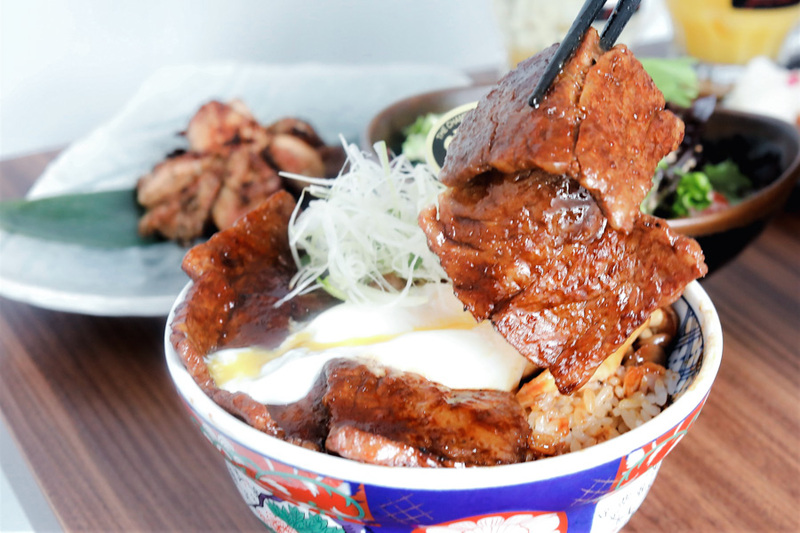 Served as a donburi, the tender Wagyu meat rest on top of rice and mushrooms. The accompanying light brown mushrooms are slightly nutty in taste with a sourdough-like aroma. 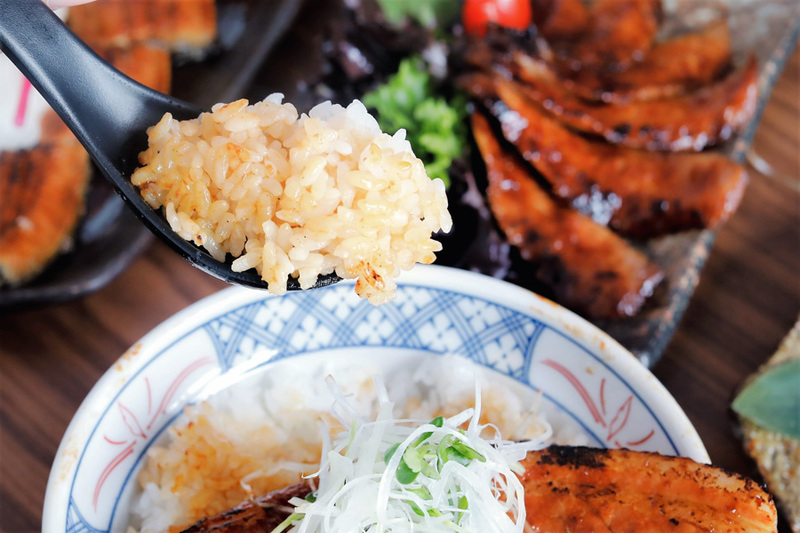 Add an onsen egg for $1 to mix up with the rice for a silkier texture. 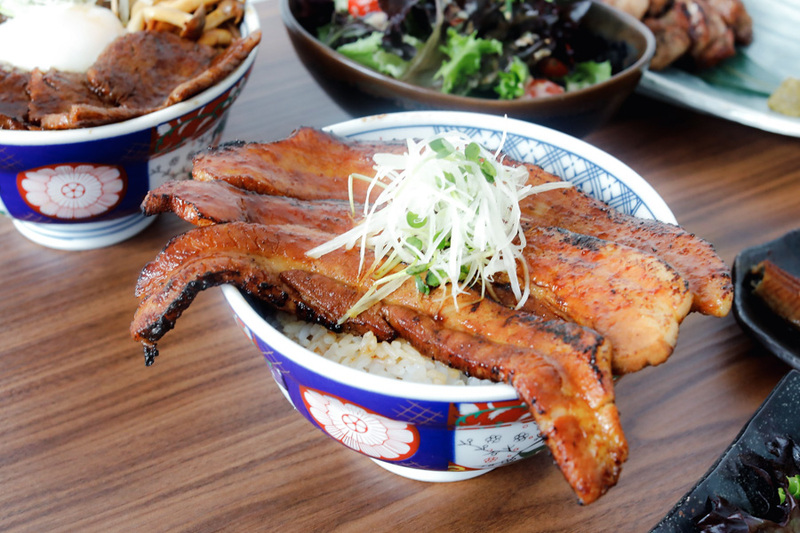 Another signature item in the menu, Buta Bara Don is made with chestnut-fed pork belly that is imported from Spain. 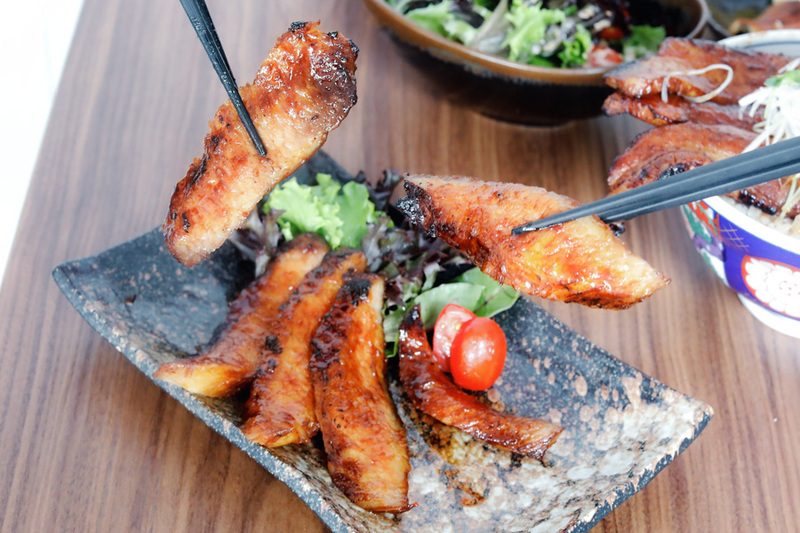 The expertly cooked pork belly is coated in a specially made sauce, and exudes a slight smokiness from the grilling. With its alternating layers of meat and fat, the belly strip turns out succulent and tender. 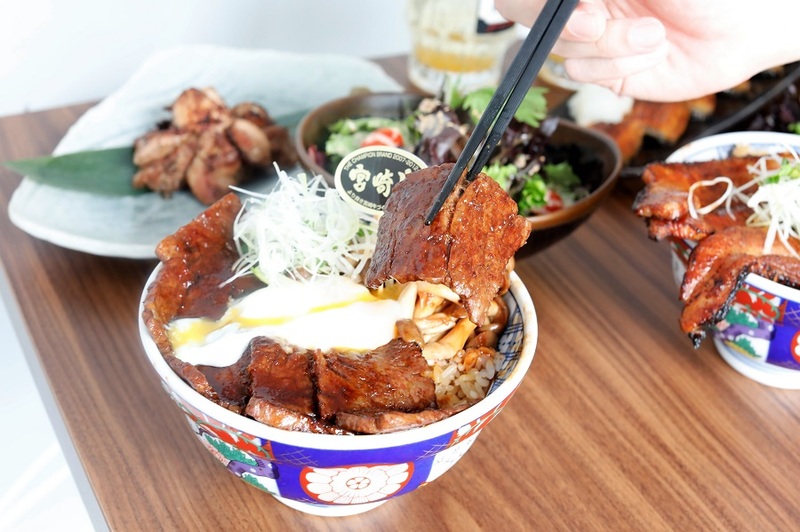 Also served as a donburi, the buta bara that comes in the form of 3 thick pork belly slices, is served over a bowl of Japanese rice. Similarly, you can add an onsen egg for $1 to boost the flavor and texture of the rice. 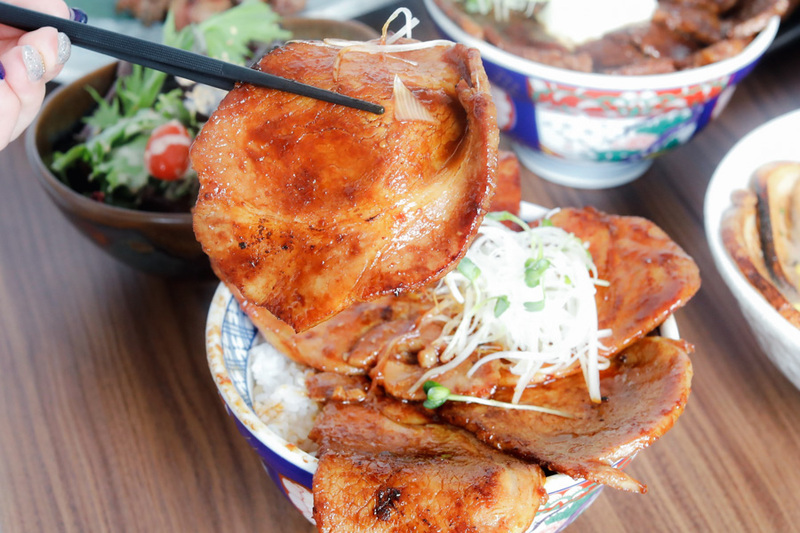 Buta Don is another top selling item in the menu, a rather generous portion of grilled chestnut-fed pork for its price. 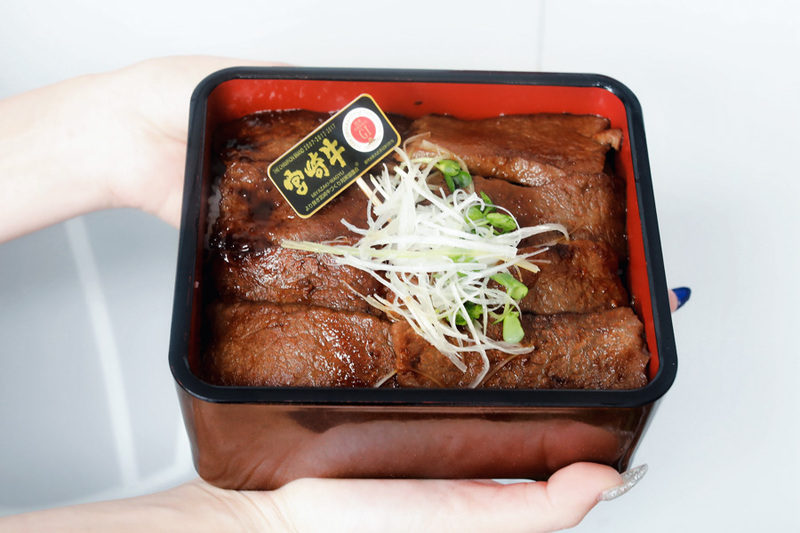 The meat cut is that of a loin, simmered in a Miyazaki Yakiniku Sauce, a sweet-savoury light glaze. 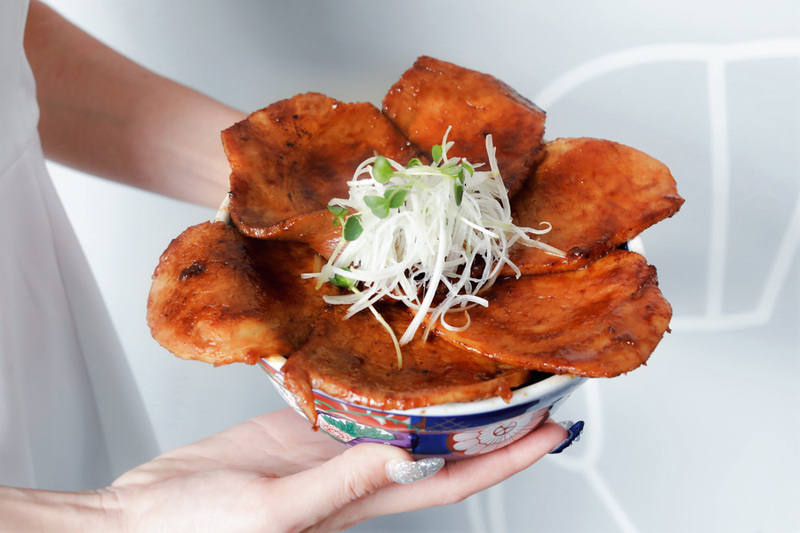 The rather huge pork slices are arranged neatly in a circular way, resembling a blossomed flower from certain angles. Relish this prime meat’s tenderness as you bite into the juicy pork slices. 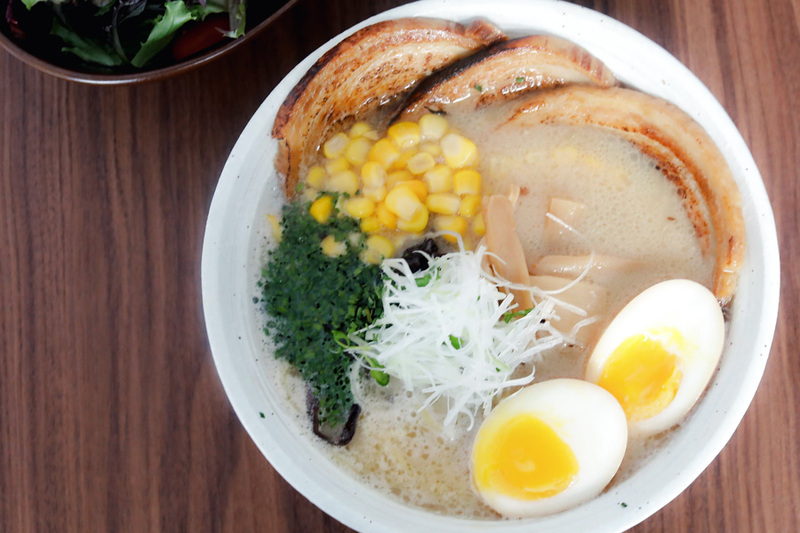 If you are craving for a comforting bowl of Japanese noodles. 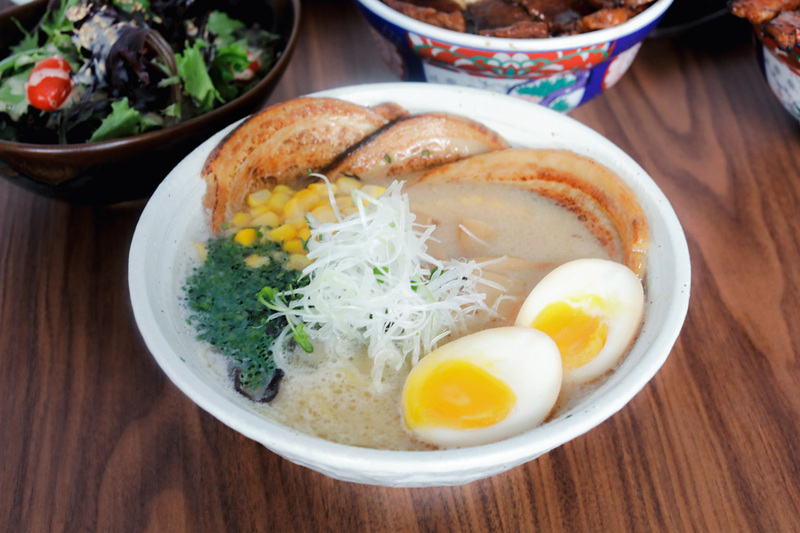 The firm and chewy wheat noodles are served in a cloudy pork-based broth made by boiling tonkotsu (pork bones) and other flavourings for several hours. 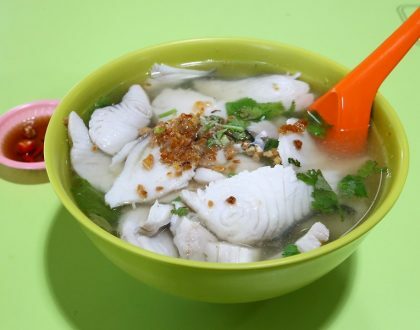 This long rolling boil, rather than a slow simmer, emulsifies the pork fat in the broth making it rich and creamy. 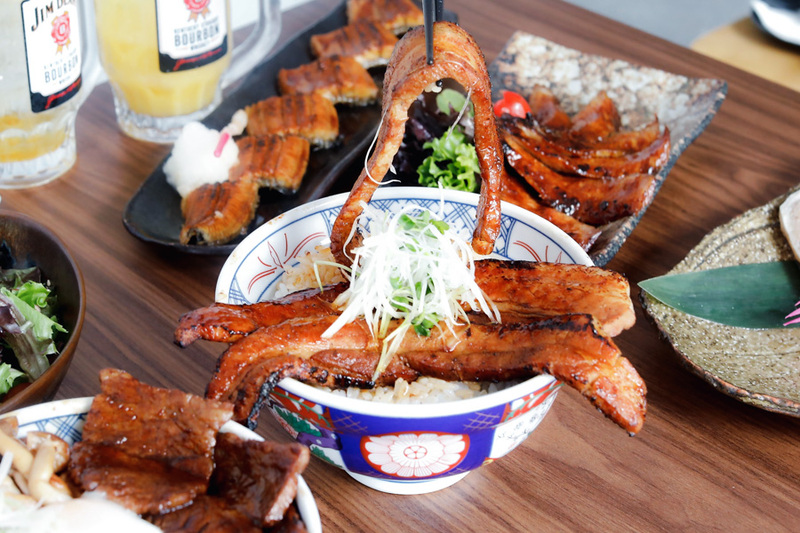 Served with slices of aburi char siew, this noodle dish also comes with half an ajitama egg (soft boiled egg or lava egg), bamboo shoots, corn, black fungus, and a sprinkling of green spring onions. 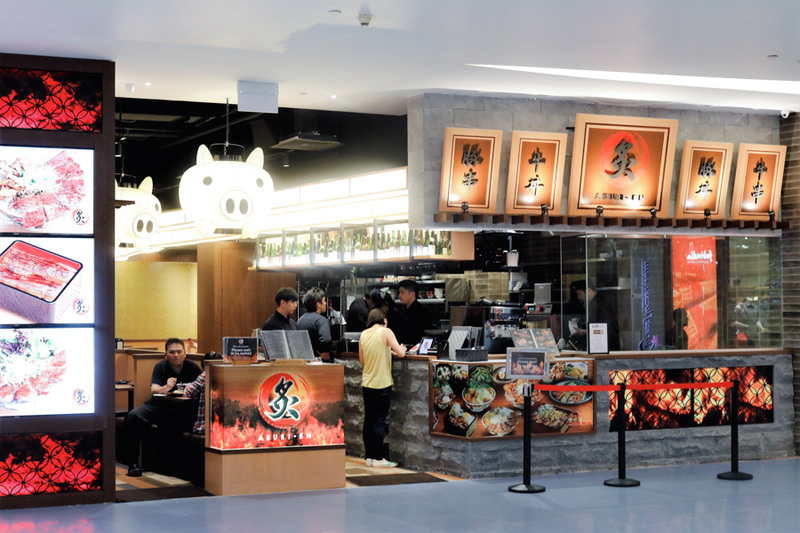 Okay, but to be honest, between the donburi and ramen, I would still rather go for the rice bowls here anytime. Complement your entrées with these side dishes, giving you more options to enjoy that unmistakably grilled umami taste in various types of meats. 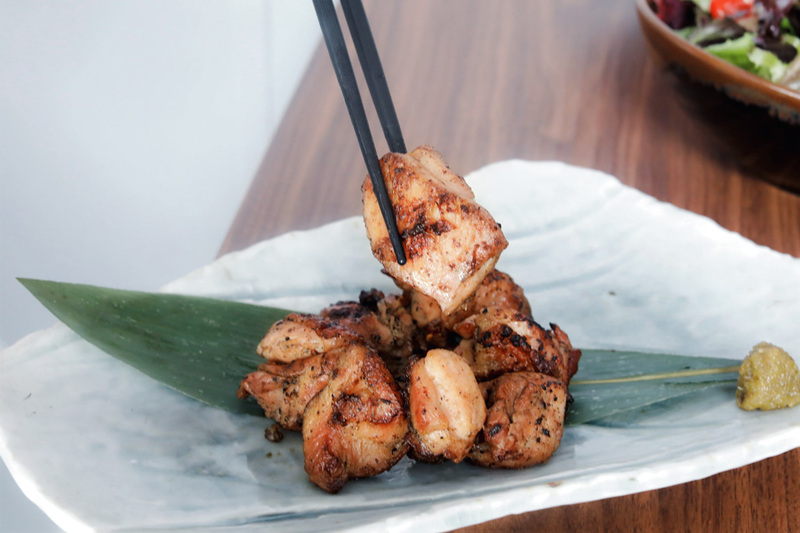 These binchotan-grilled chicken are classic Japanese appetizers, where the meat can come from the chicken thigh. Perfect as a side dish or a casual-style snack with drinks. 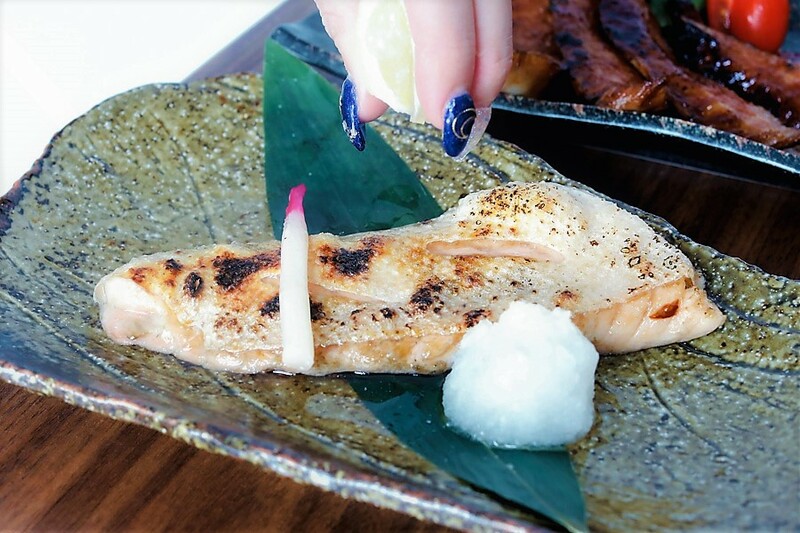 A wonderful departure from all the mouth-watering meats, this grilled salmon harasu (belly) will give you a boost of healthy omega-3 fatty acids. 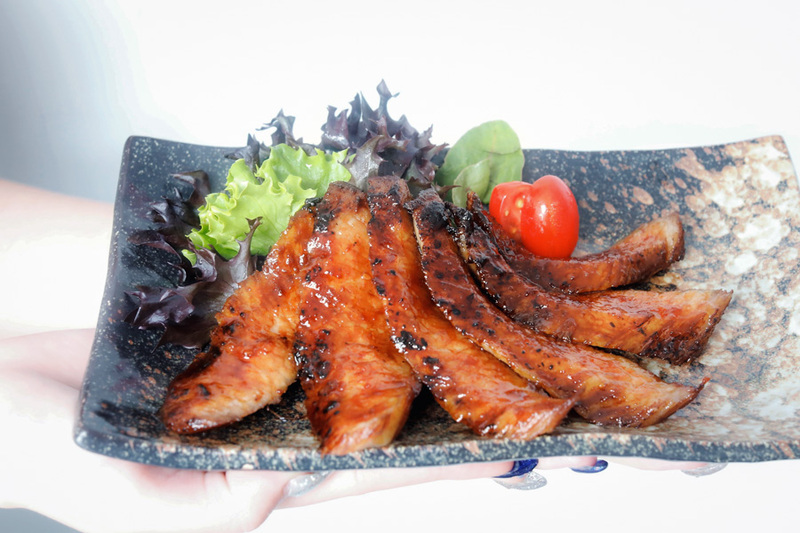 The salt-seasoned fillet is grilled on both sides without overcooking, the salmon is slightly translucent in the centre and opaque outside. 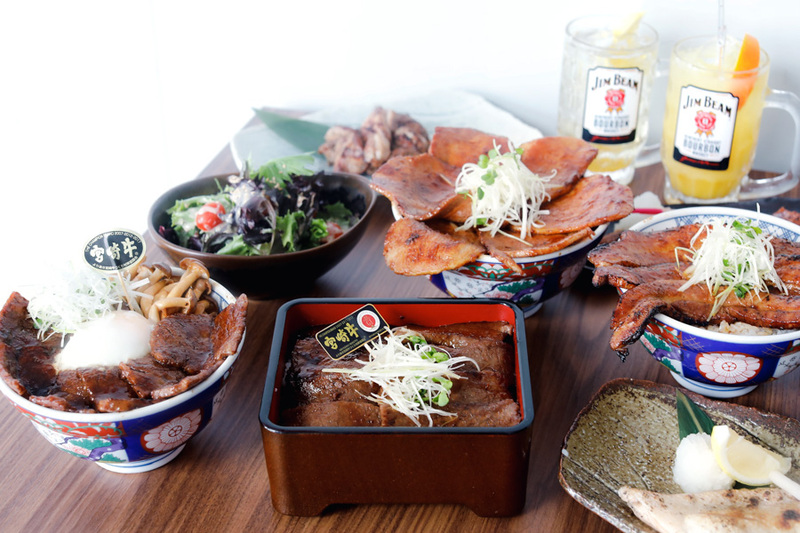 Kurobuta pork hoho (pork cheek or jowl) is a finely marbled thin slab of meat best for fast grilling. It is grilled until the marbled fat is cooked while leaving a slight char on the edges. As this is cut into small bite size pieces, you’ll encounter occasional slivers of melt-in-your-mouth fat as you savour this underrated cut of meat. Definitely my favourite side dish of all those tried. 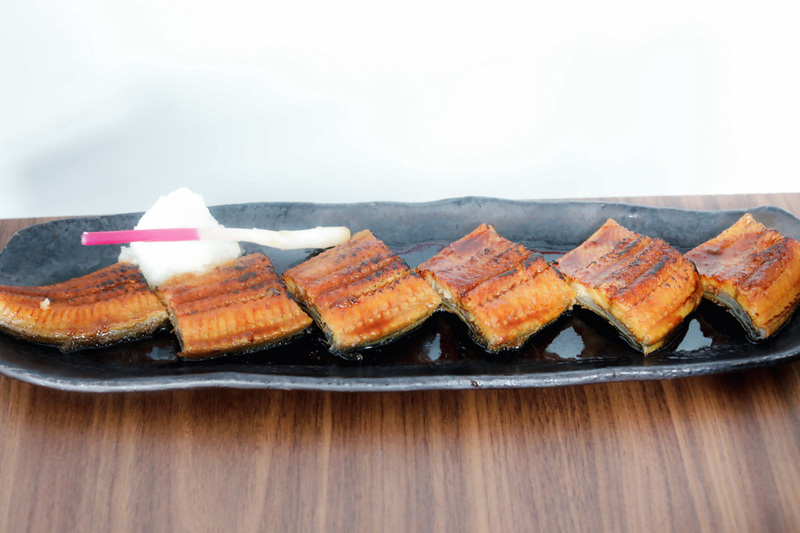 This unagi (eel) is prepared kabayaki-style, where the scaleless fish is split down the back, gutted, butterflied, and deboned. The eel is then basted with special Miyazaki sauce. Because of the sugars, this glaze creates a flavourful crispy exterior when cooked. 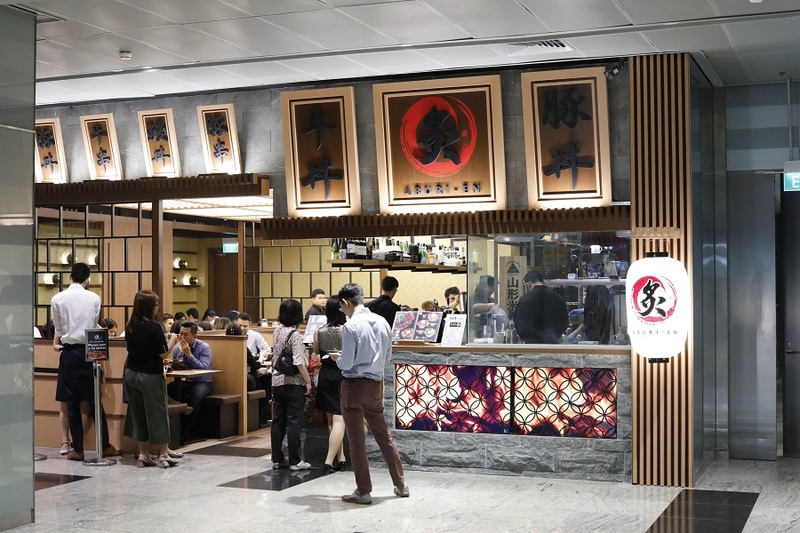 Apart from the premium donburis, Aburi-EN features an extensive selection of Japanese cocktails, highballs, shochu and sake that complements the array of grilled meats. 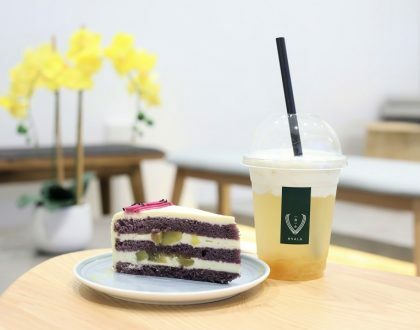 This makes it a perfect place to meet up with friends after work. Plus, prices are indeed friendly to the wallet. * This post is brought to you in partnership with Aburi-EN.